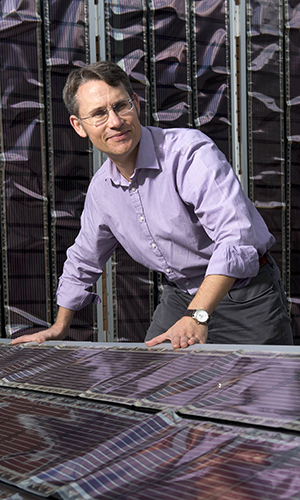 Printed solar creator, UON’s Professor Paul Dastoor said that at one hundred square metres in size, there were only two other comparable sites worldwide. “There are just three demonstration sites at this scale that we know of anywhere in the world, so Australia has joined quite an elite group of global leaders poised to make this technology a commercial reality,” said Professor Dastoor. “No other renewable energy solution can be manufactured as quickly. On our lab-scale printer we can easily produce hundreds of metres of material per day, on a commercial-scale printer this would increase to kilometres. If you had just ten of these printers operating around the clock we could print enough material to deliver power to 1000 homes per day,” said Professor Dastoor. “On the back of five years of in-house development, all of the components of these advanced electronic inks are now synthesised at scale within our Centre for Organic Electronics using non-toxic carbon-based materials. These components are then used directly or further processed into water-based inks and paints,” said Professor Dastoor. “By reinventing the delivery model we remove the need for initial lump sum outlays, overcoming the key barrier to community uptake and ensuring that the science actually ends up on our rooftops,” said Professor Dastoor. 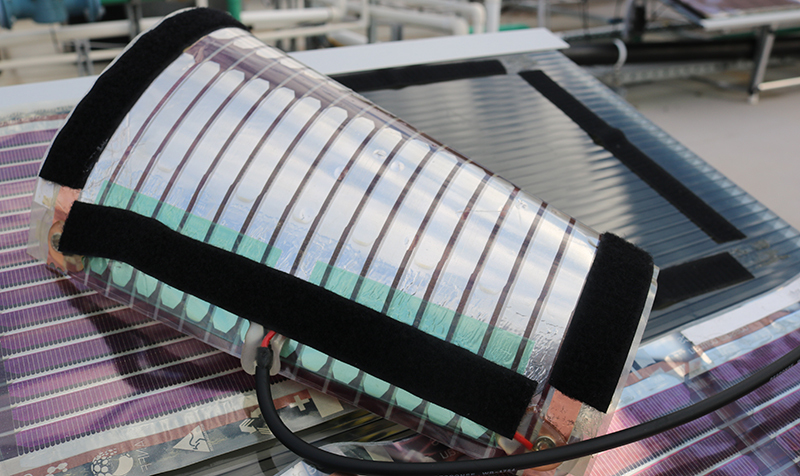 Initially, the electrical output of the site is being used for scientific study - for the first time allowing Australian researchers to monitor how large areas of these unique printed solar cells respond under different real-world conditions. Professor Dastoor said the light-weight, easy installation qualities of the material, printed at UON's NIER facility, could help cast a new light on age-old energy problems. The technology has already attracted its first commercial partner, global logistics solutions company CHEP. CHEP Australia’s Senior Manager, Sustainability Asia-Pacific Lachlan Feggans said they were working with UON to rollout a commercial scale pilot installation of organic printed solar on the roof of one of its service centres next financial year. “Through our collaboration with UON, we see the potential to make CHEP’s inherently sustainable business model even better. Our aim is to develop better supply chains, but we recognise that this begins with sustainability in our own operations,” said Mr Feggans. Professor Dastoor has been invited to demonstrate his technology at major printing tradeshow Pacprint at the Melbourne Convention and Exhibition Centre from 23-26 May, which will include Australia’s first public display of his futuristic energy technology. “We’ll be installing a custom built pop-up site which will also be approximately 100 square metres in size. This will be the first ever public display of the technology and people will be able to touch the material and walk through and under it,” said Professor Dastoor.